GENERAL DESCRIPTION: A curly-coated, fine-boned cat standing high on its legs. 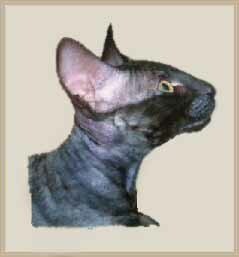 The Cornish Rex is an elegant, well muscled, alert, medium-sized cat of foreign type. They are very warm to the touch (approximately 40oC/101oF). The short, soft, plush, rippling or wavy coat, longish head, large ears and characteristic tuck up of the stomach are its most distinctive features. Although Cornish Rex appear deceptively fragile and light-weight, they have a very powerful pelvic structure, with extremely well developed buttock and thigh muscles, that add a surprising degree of substance and weight that provides them with flexibility and strength for high jumps, quick starts and amazing speed. Males are generally larger than females. PERSONALITY: Affectionate and happy, highly intelligent, extroverted, well co-ordinated, athletic cat. Very interactive with their human friends and can be easily taught to fetch and play games. The kittens are normally active at an early age, and once they begin to climb out of their box, show a great inquisitiveness for their environment that remains characteristic of the breed throughout their whole life. Very much a part of the family, or current activities, they need to be in the thick of things "helping". Also extremely gentle and loving and, will sit for hours on a knee to watch TV or just veg out. They like nothing better than to snuggle up in bed with you and very quickly adjust their biological clock to match human preferences, that is, will go to bed with their owner and not wake or get up till their owner does. GROOMING: Rex cats are very easy to groom as they do not constantly shed hair. Also renowned for their low-allergenic characteristics - often owned by asthma and hay fever suffers who are unable to have contact with other animals that have guard hairs in their coat. 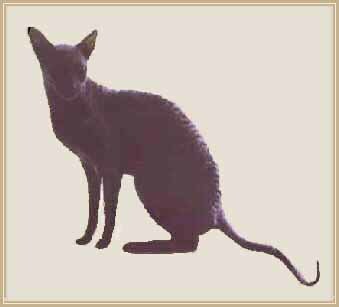 Because the Cornish Rex has a finer coat than other shorthairs - completely lacking in guard hairs (see Rex Coat for a full description) - it is not well protected against changes in temperature and should not be allowed out in extremes of weather. In fact, the Cornish Rex is happiest when it can curl up close on its owner's lap, in bed, or a well protected and covered box that is free from draughts. Note: Cornish Rex generally have a higher metabolic rate than other breeds. They are also very active cats and thus, tend to require more fuel to sustain them. In fact, most have voracious appetites and do well on a diet with regular meals of high energy food. They are grazers, eating a "little bit, a lot" rather than several large meals a day, therefore, preferring to "refuel as they go". BODY: Slender, hard and muscular. It is medium in length, with a slight tuck up of the stomach. Giving it a lean, long-limbed look emphasizing in particular, the powerful rump and thigh area. NECK: Elegant, of medium fineness and flowing smoothly to the body. TAIL: Long, fine and tapering, in proportion to the body and is well covered with wavy fur. Bulk or thickness at base is not. LEGS: Long, slender, straight and in proportion to the body, with the hind legs being slightly longer than the front, giving the appearance of being on tiptoes. HEAD: Of good length, about one third longer than its maximum width. From the front, it is of medium width across the skull, narrowing to a medium wedge and a strong chin. In profile, a straight line extends from the tip of the nose to the centre of the forehead. This continues into a flat skull, followed by a gentle curve over the back of the head, flowing into the neck. A muzzle pinch or whisker break are faults. EARS: Large, and angled slightly upwards, set rather high on the head, neither low nor flared. They are wide at the base and tapering to rounded tips, well covered in fine fur. EYES: Medium-sized and oval in shape, angled slightly down to the nose. CHEEKS: Marginally broader than the line of the wedge. JAWS: Strong, of medium width and not blunt or pointed. CHIN: Firm. In profile, of good depth and in a vertical line with the tip of the nose. Many governing bodies use a point system for judging show cats. Each breed is allocated so many points of a possible total of 100 for points for a number of specified characteristics. The Governing Council of the Cat Fancy use the following point system for judging the Cornish Rex Cat. COAT TEXTURE & LENGTH: Short, soft and plushy, without guard hairs and should wave, ripple or curl. The whiskers and eyebrows are crinkled, rather course and of medium length. All colours and patterns acceptable: SOLID COLOURS - black, black smoke, brown, brown smoke, blue, lilac, red, cream, and tortie. COLOUR POINTS - often referred to as si-rex because of the "Siamese" type colouring: seal, chocolate, blue, lilac and tortie. And more recently BI-COLOUR Rex have become very popular ie black & white/brown & white. There are no show points awarded for coat colour. Bare patches are a fault in kittens and a serious fault in adults. EYE COLOUR: Any colour acceptable. Clear and bright, in harmony with the coat colour. Colour MUST be blue in pointed cats, but Odd-eyed colour with White coats are permissible. A full description of the Rex Coat and an outline of what makes it different to the coats of other breeds of cat is outlined in the Rex Coat page. Points for the above faults are deducted from the possible total allocation for each characteristic. The points are then totalled and overall score is then appointed. The cat which attracted the highest number of points will win the breed category for the day. Best of Breed Cats are then judges as a group and an overall winner selected for Supreme Exhibit in Show. Adult cats that win in their particular class, for example, best adult female or male, are awarded a challenge certificate that counts toward championship awards. Up to ten of these awards are required to reach multiple champion status such as Silver or Gold Champion. Serious faults as mentioned above, attract a "withhold", meaning that the cat is not eligible for a Challenge Certificate or Championship points.